Hi all- just finalized plans on a "duo" workshop with Michael Reardon aws, nws in Spain next year. This is a really good chance to see two watercolorists painting similar subject matter, but in our very different and unique ways. 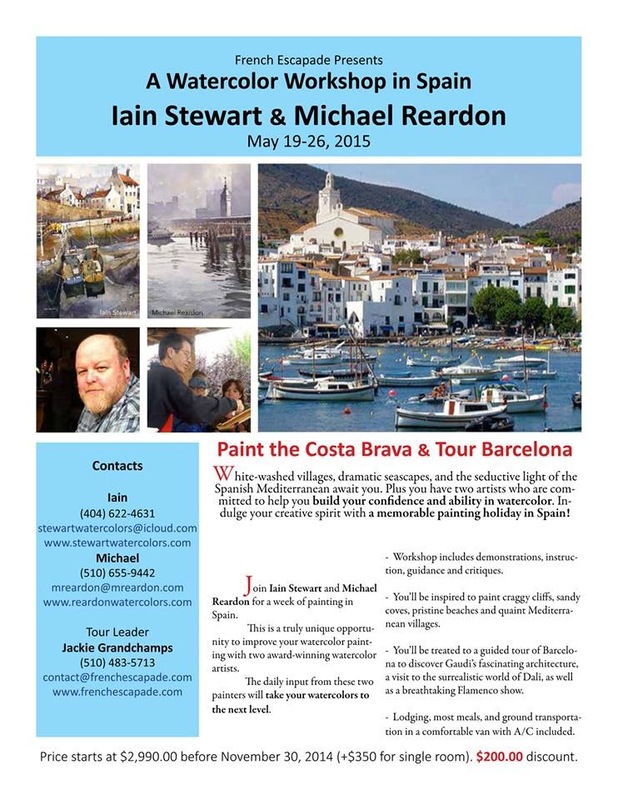 The trip takes place May 19-26 2015 and will find us painting and sketching along the Costa Brava and in Barcelona. It's not very often that we workshop instructors offer this type of workshop and should prove to be a great learning experience and one heck of a good time. Pretty much all inclusive, except for a couple of meals we will take on our own. The workshop is offered by Jackie Granchamps of French Escapade who is celebrating her 10th year of offering European tours. I'll be in Provence painting for one of Jackie's groups in a couple of weeks. I'll definitely be posting about that one soon.